1) Rising costs aren’t a problem, per se. For one, costs all around us rise, and if college costs generally rose at the rate of food and housing and other items of daily use we could adjust accordingly and not take exception to it. 2) If the benefits had gone up in accordance, few could argue (as many now do) that college might not provide enough value to merit the expense. Let’s suppose the price of cars doubled over the last ten years. Is this good or bad? To draw that conclusion we would have to ask what we get in return. If the benefits of these new cars have also gone up we might find the cost justified and worthwhile still. In fact, if the benefits of driving these more expensive cars outweighed the rise in costs we might even get excited to pay the excess amounts. Show me two cars, and if one of them will go twice as long between repairs and get twice the mileage I should expect, or even want, to pay a fair bit more for it. 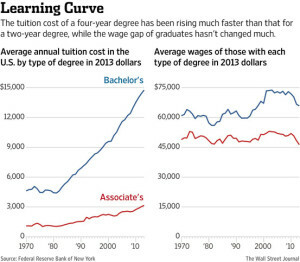 3) It’s interesting to note that while the wages of associate’s degree earners are lower than those of bachelor’s degree earners, the value of a two-year education has remained relatively stable over time (we’ll explore how bachelor’s degree pursuers can take advantage of this fact in a future Tip of the Week). Given that many pursue college largely for its economic benefits (graduates do make more, on average, than non-graduates) we must pause to consider that benefit on a net basis. While it still seems to hold true that the average graduate is better off long-term than non-graduates, even with the new expenses considered, this economic benefit is rapidly slipping. Fail to graduate, graduate on time, or graduate with a degree that pays off, and the “benefits” of college become pure burden. This is not to say that students shouldn’t seek a college education. At risk of sounding like a broken record, this does mean we must be more diligent in our planning so as to address the cost and ensure a benefit actually materializes.